With the counting of ballots getting underway since today morning, results for the 18 Municipal Councils and 8 Nagar Panchayats are starting to pour in for the election carried out on the 11th of this month at a total of 587 polling stations with 2,36,302 voters to elect representatives of 279 wards and 558 Ward Development Committee members. The results till the time of filing this report indicates a big leap for the BJP, with Mayang Imphal Municipal Council witnessing a huge win for the party with 6 candidates winning out of 9 nominations in 13 wards contested, while 2 BJP-supported independent candidates also won. Congress maintains their stronghold at Andro Nagar Panchayat with 9 wins while BJP managed 3 wins. Lamlai Municipal Council also mirrors the change with BJP winning in ward nos. 1, 3 and 6 with Congress winning at ward no 4. Ward no 5 was declared a draw with BJP and Congress securing 171 votes each. Decision for a Postal ballot is awaiting presently. Mayang Imphal which is the constituency of the Works Minister suffered a big setback with Congress managing only 2 wins while BJP managed a coup of sorts winning 7 and helping 4 independents with the support of the party to victory of the 13 wards contested. Bishnupur registered 8 wins for Congress while BJP had to settle for 4 wins. 6 BJP, 2 Congress and 1 independent registered wins for Nambol Municipal council. Kakching Khunou, the stronghold of ex-Works Minister and sitting MLA Ranjit also suffered heavy casualty with BJP getting the better in 6 wards while 2 independents and a lone INC victory completes the tally. Of the 12 wards contested at Kakching MC, ward no 1 gi INC Mayanglambam Memcha Devi of INC beat Sh Tondon Devi of BJP at ward no1. It can arguably be stated that the present Chief Minister of Manipur- Okram Ibobi should be credited with ushering in a stable government after the chaos and confusions of political infightings and party-hopping that was threatening to disintegrate the already volatile political scenario in the state. That he was selected from amongst a motley crew of political heavyweights contending for the top post by the centre speaks volumes of his underestimated ability to convince and control the situation. He was, in all fairness, a rank outsider when it comes to the race for the Chief Minister’s chair, but to the incomprehensible amazement and no small sense of betrayal, he became the man at the helm of affairs, and love it or hate it, he has been at the most coveted political post for three terms consecutively. While the vicious criticisms and accusations of his style of governance and questions about his earnestness to develop the state continue unabated, it must be said that at present, there is a semblance of political stability, if not anything else, and that this general perception has been able to pacify the public on various counts so far. There is also a subtle yet perceptible change in the atmosphere and attitude of the bureaucrats dispensing their entrusted duties to the state. Of late, the sense of urgency and earnestness being displayed by these bureaucrats have proved to be a welcome relief and a reason for raising one’s hope of a better state, albeit still with dollops of cynicism and reservations. One prominent example of the positive change being witnessed by the public is the alacrity and enthusiasm with which the Clean Imphal project which is being carried out as a precursor to the efforts and objective of developing Imphal into a Smart City. The increase in the drive and energy of the workers is unmistakable, and would only be possible when the authorities and bureaucrats at the top have encouraged and provided the much needed fillip to boost the morale of the workers. Another instance worth mentioning is the efforts being put in by the Manipur State Power Distribution Corporation Limited (MSPDCL) since it inception in 2014 not only to provide prepaid metered power supply to every family in the state, but also the relentless drive to spread awareness regarding judicious use of power and ways to conserve energy- steps which would benefit the consumers as well as the state as a whole, making Manipur self reliant in power and saving valuable resources while being able to enjoy uninterrupted power supply. The Regional News Unit of All India Radio, with the initiative of an individual from the state have tapped the tremendous reach of social media networks to popularize and made available the news of the region beyond the conventional reach. The changing face of bureaucrats can also be gauged by an incident when a newly selected bureaucrat defied threats from seniors and politicians, refusing to sign an acknowledgment for a shabby contract work, even to the point of being deputed elsewhere. The energized and enthusiastic bureaucrats, especially the young crop should be encouraged to dispense their duties without restraint or undue pressure. An assuring and encouraging attitude from the Chief Minister will go a long way towards that end. 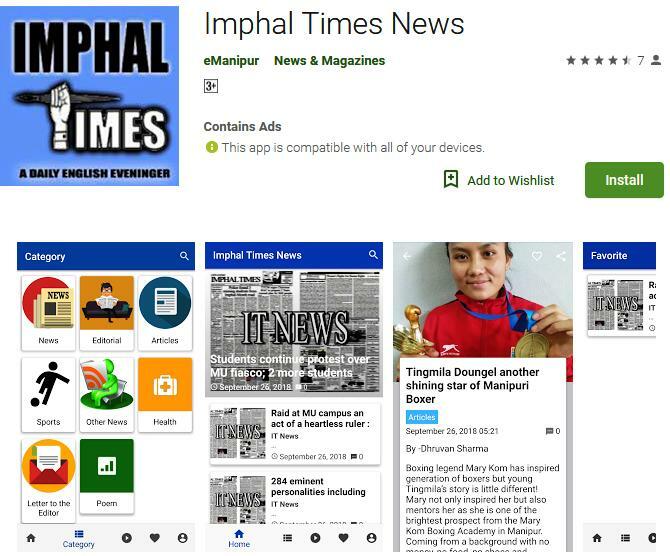 There are also entities like Imphal Times ready to stand up and provide support anytime- everytime. Being pampered by one’s parents, guardians and elders, receiving the loving care and attention from them and playing hide and seek with friends are some of the most memorable moments of every life. But what may be the memory of a boy who is hardly 12 years of age, who has missed all these sweet moments and taking the responsibility as the main bread earner of his family. Naobi, a cute and smart hotel boy of Nambul hotel, located just opposite to the office of Imphal Times at Elangbam Leikai still has the seemingly unattainable urge to continue with his studies. He dropped his studies just before giving his class V examination since his family’s deteriorating financial condition forced him to work in the hotel as substitute to his unhealthy mother since four months back. With the daily wage of Rs 200, Naobi just barely manages to keep the fire in their kitchen burning. “ I buy rice, vegetables, groceries and other necessary kitchen items and sometimes medicines for my parents”, replied the boy when this reporter asked “What you do with the money everyday”? Naobi said “I will continue with my school again” when inquired about his plan for attending classes again. Naobi is the second of two sons of Hijam Naba Singh and Hijam Ongbi Hemabati of Ningom Thongjao near PPLYW Club under Kakwa Police station. The boy disclosed that his father used to work at a brick field, but cannot go to the work regularly as he falls sick very frequently. He said his brother Somojit (15) too dropped his studies while studying at class IX and go around looking for any available menial work. He also informed that his brother does not return home during night, but said he has no idea where his brother is going or what exactly he is doing. Expressing her love and sympathy for the boy, Oinam Sushila, owner of the hotel where Naobi is working at present, informed that she had even asked Naobi to stay with her as her adopted son, but that Naobi denied as he has to look after his ailing parents and care for his family. Sushila said Naobi joined the hotel around 4 months back as substitute to his mother who contacted the hotel for work. “Since Naobi’s mother was critically unhealthy she send her son as her substitute”, said the sympathetic employer. Naobi travels everyday on his Bicycle. He reaches the hotel by 7 am works till 6 in the evening every day. No doubt there must be many more destitute children like Naobi in the society on one side, forced to face the harsh fate, his precious childhood cut short by circumstances while on the other, the state must be having provisions and various alternatives for rehabilitation and social reintegration such as foster care, sponsorship and aftercare of such children which have remain unutilized due to the lack of awareness, or worse still, as a result of the indifference of those authorized and entrusted with the authority and resources to address such unfortunate incidents. BJP MLA of Thangmeiband Assembly Constituency, Kh Joykishan today visited the injured Journalist of Sangai Express at JNIMS casualty, special ward. Athokpam Jiten, aged 39 suffered major injury on his jaw and had to go through dental treatment due to an unfortunate incident occurred on the night of January 11 at Keishamthong. He was rush to the JNIMS casualty ward on the very same night and is under treatment since. MLA of Thangmeiband Assembly Constituency, Kh Joykishan visited JNIMS special ward at round 3:30 pm today to meet Jiten. Later Joykishan extended financial assistance to the injured. Deputy CM Gaikhangam is all set to attend the business conclave at Myanmar to be held on January 18 and 19 at Town Hall, Monywa, Sagaing Region, Myanmar. He is expected to deliver speech with special emphasis on the border trade and investment between the North Eastern region of India and Myanmar including banking sector. The conclave is organized by the Consulate General of India in Mandalay in collaboration with the Sagaing Region Government (Myanmar) and the Indian Chamber of Commerce (North East Chapter), Guwahati.The Reserve bank of India has abolished the barter trade system that was operating along the India-Myanmar border for a long time since 1994 thereby creating a broader window of opportunity for trade between the two countries. Around 30 Indian companies are participating in the Regional Business involved in trade between India and Myanmar especially through the land border apart from opportunities for business matching. Minister of State for Science and Technology and Earth Sciences, Y S Chowdary is likely to visit the State on a two day visit on January 21. The Minister will attend a program at the institute of Bio-resources and Sustainable Development at Takyelpat on the second day during his visit. The Minister will be visiting CSIR Jorhat in Assam before coming to Manipur. 15th Voluntary Blood Donation Camp with Campaign 2016 organized by the Life Savers Manipur (LISAM) in collaboration with Pioneer Club, Lamdeng Makha Leikai, Imphal West in support of State Blood Transfusion Council, MACS and Blood Bank & Transfusion Unit, JNIMS is going to be observed at the Auditorium Hall of R.D.O. Lamshang, Imphal West on 17th January, 2016. In a press release, K Padmakumar Sharma, managing Director of LISAM said that willing volunteers between the age group of 18 to 65 years with a body weight of not less than 45 kg and who have not suffered from any major ailments during the last one year can donate blood. Volunteers who have already donated blood through LISAM and have not got their donor card can collect it from the Blood Donation Venue or from the Managing Director of LISAM after providing their identity proof, Padmakumar details. The blood donation camp will commence at 10 in the morning and will continue till 3 in the evening.